Is it “wise” to get the wisdom teeth removed? 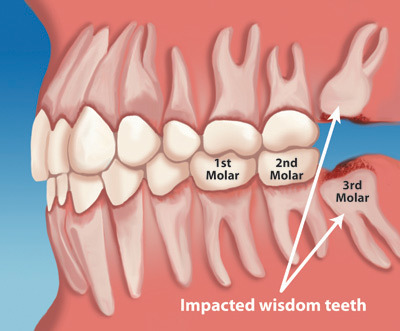 Wisdom teeth, or third molars, get their name from being the last teeth in the mouth to erupt into place. They usually grow in between the ages of 17 to 21 years, which is referred to by some as the “age of wisdom.” Parents, if your child has already had braces, the orthodontist may have noted that his or her wisdom teeth should be removed at some point. While not all people need to have their wisdom teeth removed, because of this late eruption, many young people’s jaws do not allow enough room for this last set of teeth to move in. Therefore many wisdom teeth come in sideways or never erupt at all and stay “impacted” in the jawbone. Often wisdom teeth only appear partially and make it very difficult for people to clean the tooth effectively with their toothbrush. Wisdom teeth will often cause pain as they grow into place. This is because they are pushing on and breaking down the teeth in front of them or they are harboring bacteria under the gums and causing an infection. However, they don’t always present with symptoms, which is why it is important to have your Aspen Creek dentist do a consultation and exam in order to determine if they should be removed or notThe best time to have the wisdom teeth removed is between the ages of 16-18 when the roots of the teeth are not fully developed. The longer you wait, the more difficult they will be to take out, and the longer it will take for the tissue and bone to heal and recover. Do you need an oral surgeon to have your wisdom teeth removed? If it is a complicated case or the patient prefers to be under anesthesia, then we will refer them to an oral surgeon. However, most wisdom teeth cases are common procedures that we can do right in the office. Many patients find that nitrous oxide (laughing gas) is enough to relax them and make them comfortable throughout the procedure. Other patients may elect to take a medicine prescribed by their Aspen Creek dentist in order to help them relax and not think about the treatment being performed. 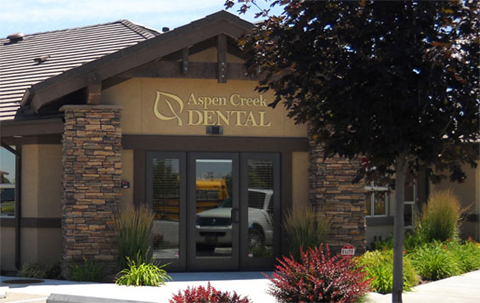 If you have any questions please contact our office and your Aspen Creek dentists will be happy to assist you.